Recently, there has been a lot of talk about cladding removal in London. Eighty seven tower blocks in the UK have been reported to have used the same type of cladding as the Grenfell Tower. The same cladding was used on other buildings around the world that were hit by fire. More and more cladding samples from London properties are being checked to see if they meet British standards. So, the correlation between cladding defects and fire does not seem to be an accident. It is crucial to spot the connections between key elements in the building we are taking care of. You don’t always have to remove cladding from your house, but the light of recent events, it is more important than ever to make sure you have safe cladding, especially if you have your house or building covered with cladding made of Aluminum Composite Material (ACM). It is not dangerous if you use the right type of ACM. If you are the owner, landlord, or manager of a private tower block or building, you can have your sample checked for free by the Department of Communities and Local Government. You can read more about it here: Property Wire. Lots of boroughs around London take precautions and remove claddings from their buildings even if they know that the cladding used is fine and the insulation materials are different than those used in Grenfell Tower. However, it is not a bad or money-consuming step – it is safer to take action and be one hundred percent sure that what you have on the outside of the building will not fail. Especially now, if you are an owner of such a residential building, it is crucial to take action and make sure your residents feel safe and taken care of. Not everybody will stay in a building that has not been checked or had its cladding removed. If you need a company that will quickly remove any defective cladding that doesn’t meet the fire protection standards, you have come to the right place. We are equipped with the highest quality equipment to work at heights using ropes, so we can assure you that our services meet the most stringent of standards. Also, we are able to install new, safe and secure cladding on your building in no time – check it here. If you have any concerns about cladding removal or checking, please let us know. We are happy to answer any of your questions! 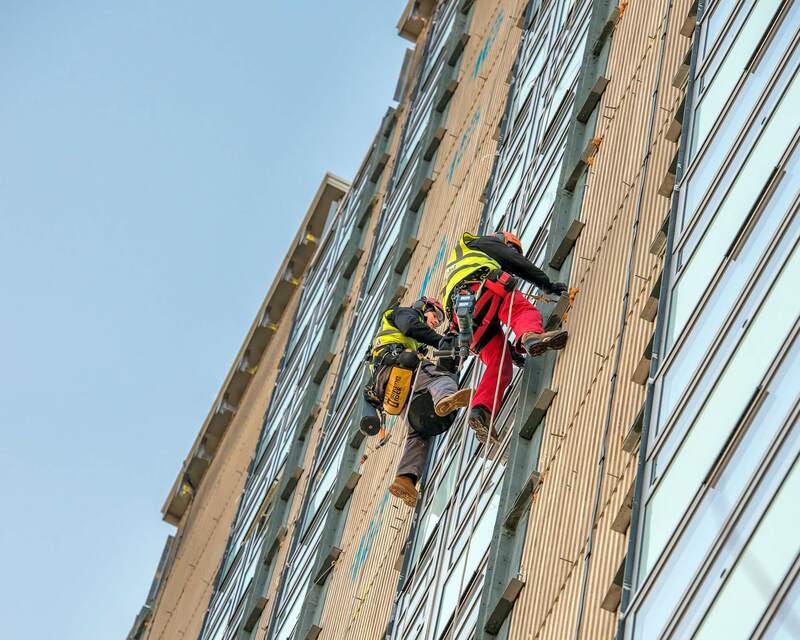 What Types Of Cladding Services We Provide? You can choose from wood, stone, brick, metal, stainless steel or glass for a new cladding installation.